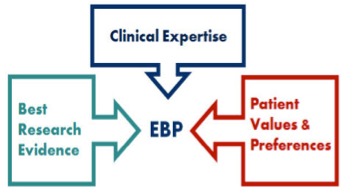 By using Evidence Based Practice you are aiming to provide the most effective available best practice care to improve your patient outcomes. Constructing a well-built clinical question can lead directly to a well-built search strategy. Note that you may not use all the information in PICO or well-built clinical question in your search strategy. You can also consider alternatives to PICO. including SPIDER, COPES, ECLIPSE, PIPOH, PECODR etc) based on field of study (eg: medicine, OT, social work, speech pathology, oncology etc). Kloda LA., Bartlett JC (2014) Formulating Answerable Questions: Question Negotiation in Evidence-based Practice. Journal of the Canadian Health Libraries Association / Journal De L’Association Des Bibliothèques De La Santé Du Canada, 34(2), 55-60. 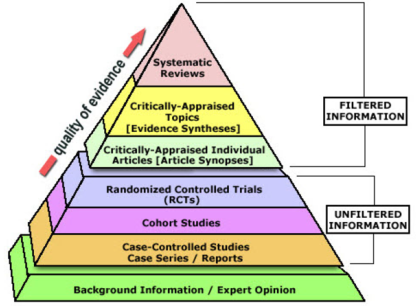 Literature that is trustworthy has been appraised for their validity (truth, or reliability in results) and applicability ( that is usefulness in clinical practice). Not every research article published has high levels of validity and applicability so looking for a few things within the article itself can help you determine if the article is suitable for use as a source. Validity of the study or data - what was the chance of bias, can the data and theories apply to other situations or people? Research method used - does the method ensure rigor and trustworthiness? Source of the literature - is it from a reputable source?
. EBM Pyramid and EBM Page Generator, copyright 2006 Trustees of Dartmouth College and Yale University. All Rights Reserved. Produced by Jan Glover, David Izzo, Karen Odato and Lei Wang.